This is happening with BizTalk projects under unit tests. 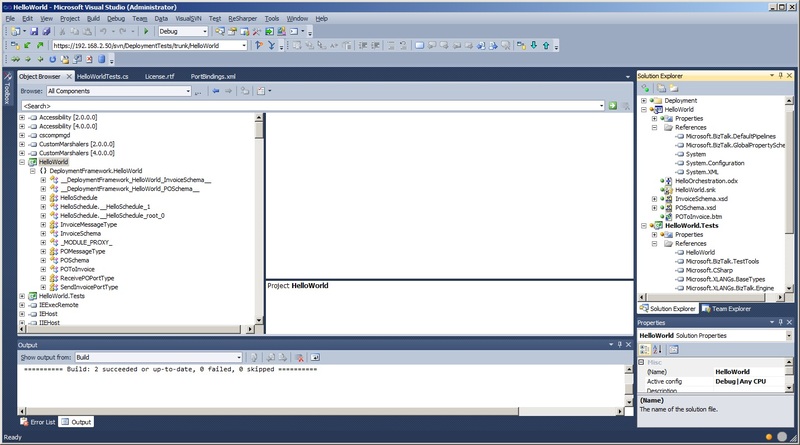 First image shows Object Browser with HelloWorld object exposing classes I want to test. Second shows proper references made and unresolved symbol in red. I have to mention that projects build and run properly but there are lots and lots of Resharper errors indicated throughout the project which is annoying. What could be causing this? I'm running BizTalk 2010 and VS.NET 2010. Thanks for the post. I'll try to reproduce this on my side. store your caches). That USUALLY clears up this kind of stuff for me. Object Browser with HelloWorld object exposing classes I want to test. Thank you for looking into it. I cleared the cache but it didn't help. The most important thing is that, although very annoying, projects work. Thanks again. I get this same issue while in unit tests for BizTalk 2009 projects inside VS2008 while trying to test maps. 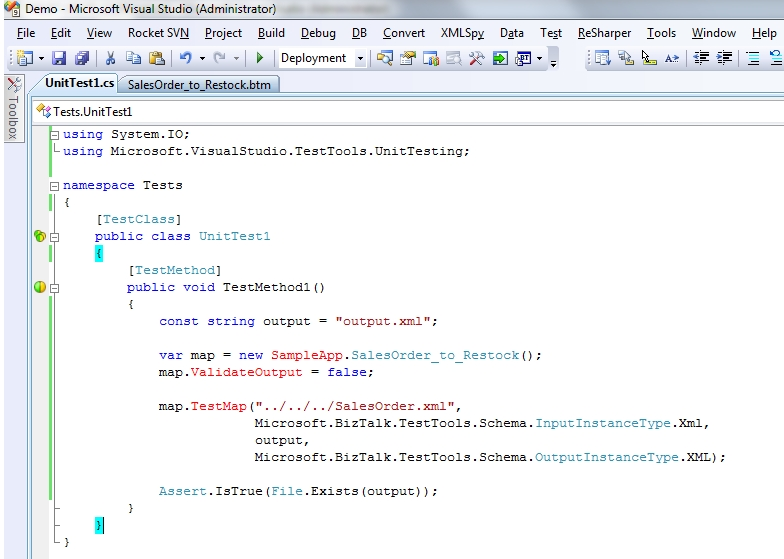 BizTalk unit tests are a different beast and are handled different than any other unit tests so maybe this just isn't supported by ReSharper. Any ideas from those in the know? I've created a bug request http://youtrack.jetbrains.net/issue/RSRP-272945 and you are welcome to monitor its status. Unfortunately I can't reproduce unresolved red code on a simple solution. Could anyone create a simple demo solution for us? Thanks in advance! Here you go, please see attached zip file. Please note that intellisense does not work either. The exact same thing happens to few of my projects occasionally. One more thing, when it's not resolving the symbols and I go to the specific class or member I get an excepotion and then it seems to recognize it. It also happens in ASPX pages I get 'invalid module qualification failed to resolve assembly' I know that there's a ticket about it, just thought that this might be important too. Thanks a lot for the sample. I've reproduced this and we will try to fix it in upcoming R# 6.0 bugfix update. Could you please try to create a simple demo solution which could demonstrate this? I hope you have a different problem than Chris is experiencing. I'll try to create a small project that produces this problem. I removed the control directives, build the website again, I got this error "Unknown server tag 'esh:DynamicDataSource'", removed the control from the aspx page, dragged it again to the aspx and it seems to work fine now. 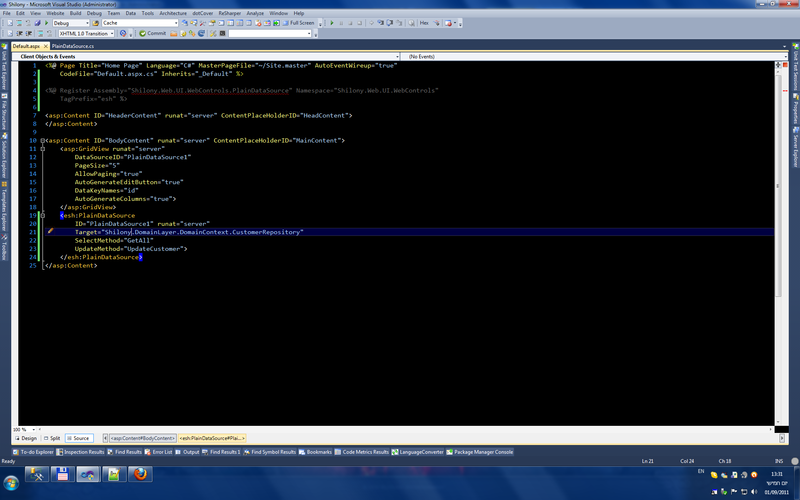 In short, removing the control and adding it back seems to fix it, although it's random so I can't really explain it. I'm trying to reproduce it, once I'll have more information I'll post it. I think I know how to reproduce this issue, at least in my current project. I'm working on a component that is a server control, it seems to happen whenever I'm changing something like adding or removing a property and recompiling it. However, I created a test project to reproduce this problem and it doesn't happen there. In a few days I'm going to put this project on CodePlex so I can just attach a copy for you or give you the link. Here is a new image that know it tells me that I can safely remove the directives. 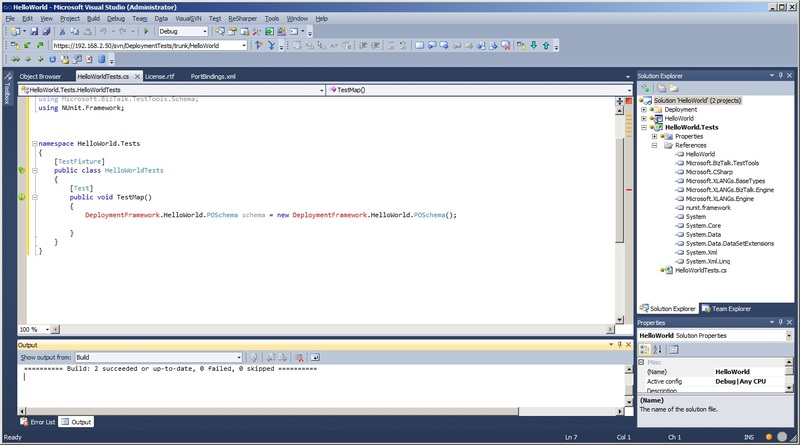 Just to add I am getting a similar issue in a project converted from Visual Studio 2008 to Visual Studio 2010. In VS 2008 this was an assembly reference. 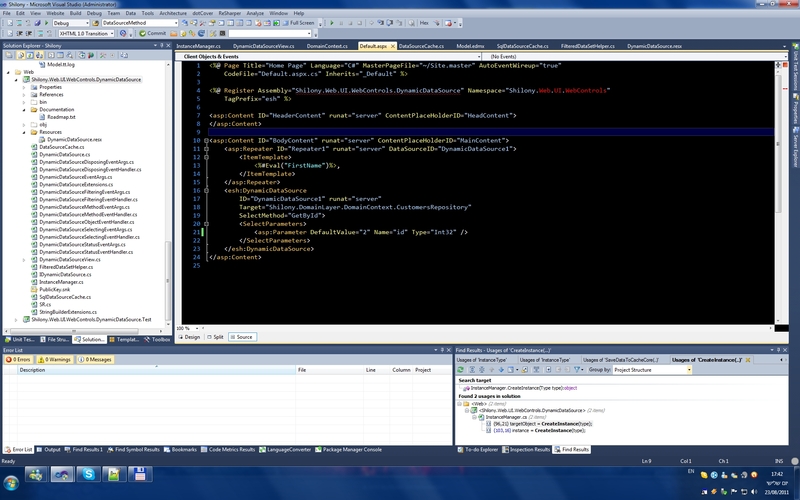 In VS 2010 it is a project reference. The code builds just fine. It is not a Unit Test project. This is build 6.1.37.86. Additional notes: These are not standard schemas. These are custom context properties from a custom property schema. No BizTalk schemas and nothing from the namespace are listed. I just installed version 6.1.1000 and same problem.